There are four United States to Canada border crossings in the Niagara Falls area, all within 28 miles (45 kilometers) of Buffalo, New York. The Peace Bridge and Lewiston-Queenston Bridge crossings are among the busiest of all Canadian border crossings. Whirlpool Rapids Bridge and Rainbow Bridge can move much faster, as Whirlpool Rapids Bridge is reserved for NEXUS pass holders and Rainbow Bridge is void of commercial traffic. All four bridges offer convenient passage into southern Ontario and Toronto and are used by those traveling to Niagara Falls, Canada or the Niagara wine country. But which one to take at the time of your journey should depend on factors like preferred route, wait times, and duty-free shopping opportunities. Don't blindly trust Google, Waze, or your car's navigational system to get you across the border. Most GPS's tend to route vehicles to Canada via the Lewiston-Queenston Bridge crossing since it's the easiest to access from major highways. Instead, use the apps to research your choices, taking wait times into account. You can also use numerous overhead signs to avoid huge lineups, which can run up to two hours. These signs will alert you long before the crossing, allowing you to re-route when necessary. Tune into AM radio station 1610, call 1-800-715-6722, or check the Canada Border Services website on your phone to assure speedy passage. And don't forget the shopping! Not all crossings have duty-free outlets. So if you're dying for a retail fix, it might be worth a longer wait time. The Lewiston-Queenston Bridge connects Lewiston, New York with Queenston, a community in the town of Niagara-on-the-Lake, Canada approximately three miles (five kilometers) north of Niagara Falls. Lewiston-Queenston is one of the busiest U.S. to Canada border crossings, along with the Peace Bridge crossing 45 miles away. It's also the major border crossing for commercial trucks. The primary U.S. highways leading to the Lewiston-Queenston Bridge are Interstate 190 and Route 104. In Canada, the QEW (Queen Elizabeth Way) and Highway 405 access this route. This crossing has a dedicated NEXUS lane for both U.S. and Canadian-bound traffic. The U.S.-bound lane operates Monday through Friday from 6 a.m. to 8 p.m. and the Canada-bound lane operates Monday through Sunday 8 a.m. to 8 p.m. The rest of the lanes operate 24 hours a day, 7 days a week and there is duty-free shopping on site. Before making your way to Whirlpool Rapids Bridge, make sure everyone in your car has a NEXUS card, as this is a dedicated NEXUS crossing. NEXUS passes are available to both United States and Canada residents and they allow for pre-approved clearance, speeding up passage. It's a nice option to have if you travel back and forth for work or if you frequently visit family on the other side. However, if you stumble upon this border and don't have the pass, you'll be turned around to another access. The Whirlpool Rapids Bridge crossing connects downtown Niagara Falls, New York with the old downtown of Niagara Falls, Canada. The border is open from 7 a.m. to 11 p.m. Commercial trucks are not permitted to cross here. And, there is no duty-free shopping available. It's mostly smooth sailing over the Rainbow Bridge crossing, which bans commercial vehicles. This popular tourist crossing connects Niagara Falls, New York with Niagara Falls, Canada and is the most direct route to the Niagara Fallsview Casino. For this reason, summer weekends can become particularly congested, so plan accordingly. The main U.S. highway leading to Rainbow Bridge is Interstate 190. To access it from the north, take exit 420 off of the QEW (Queen Elizabeth Way). There are dedicated NEXUS lanes for U.S.-bound travelers only. Pedestrian crossing is allowed, and there is duty-free shopping on site. Peace Bridge connects the cities of Buffalo, New York and Fort Erie, Canada. This mile-long bridge, with only three car lanes, often has long wait times, especially on weekends or for events like a Buffalo Bills game. Even still, the Peace Bridge crossing remains popular with travelers and is close enough to other area border crossings should you need to make a last-minute re-route due to wait times. 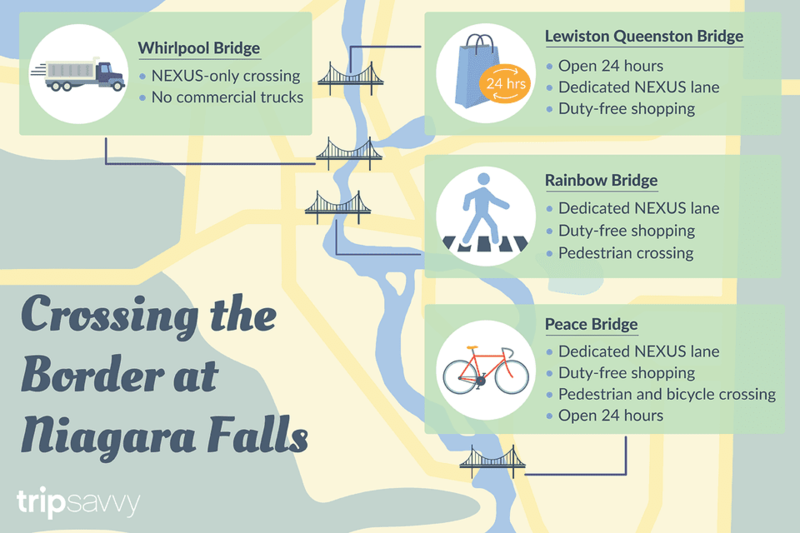 The Peace Bridge crossing is open 24 hours a day, 7 days a week and has dedicated NEXUS lanes (with limited hours) going both directions. Pedestrian and bicycle crossing is allowed and duty-free shopping is available on site.